It wasn’t so very long ago that I had the pleasure of reading the Sophie Allen series for the first time. I have read and loved each and every book in the series. I devour each new book as it is released. 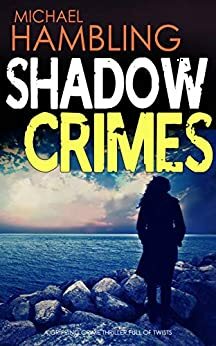 I have been very impatiently waiting for book seven in the series but ladies and gents, the wait is now over because ‘Shadow Crimes’ was released on 23rd October 2018. I couldn’t wait to get my hands on a copy and dive straight in. ‘Shadow Crimes’ was so worth the wait and I absolutely loved it but more about that in a bit. DCI, now Detective Superintendent Sophie Allen has to be one of my favourite female lead characters. She’s strong, she’s feisty. she’s determined, she’s stubborn, she has a stable sort of family life and she has a cracking sense of humour. Sophie sounds like a lovely person to work with. She takes on her fair share of the workload and she wouldn’t ask you to do anything that she wouldn’t do herself. Sophie is loyal to her colleagues and Sophie has your back. If something doesn’t seem right to her then she won’t hesitate to scratch the itch so to speak and she will investigate until her curiosity has been satisfied and the matter has been fully investigated. Sophie has a knack of getting to the truth and making sure that the guilty party pays for their crimes. This latest case certainly keeps Detective Superintendent Allen out of mischief and gives her a lot to think about. Oh my giddy aunt, ‘Shadow Crimes’ is another fantastic read from Michael Hambling. I was hooked from the first word on the first page and reading the book felt like reuniting with old friends. Reading ‘Shadow Crimes’ became a serious addiction. I couldn’t get enough of the book and I just couldn’t put the book down. It wasn’t exactly glued to my hand but it might as well have been because it came everywhere with me. If I had to put the book down then I was counting down the time until I could pick the book up again. I begrudged having to break off from reading, which did not go down well with my two dogs. The book is written in such a way that the story jumps off the page and seems to come to life. I know that this is a work of fiction but if I consider a book to be well written, I tend to ‘live’ the story and I also feel part of the story. Reading ‘Shadow Crimes’ was much like being on a slightly scary and very unpredictable rollercoaster ride with twists and turns aplenty. In fact there were more twists and turns in this book than you would find on a ‘Snakes & Ladders’ board. I have to say that this book certainly kept me guessing. I would smugly think that I had worked out who was the murderer, only to realise that I had the wrong end of the stick entirely and it was actually somebody else. I absolutely loved, loved, loved reading ‘Shadow Crimes’. I wholeheartedly recommend this author and his books to other readers. The only problem now is that I have to wait a while for the next book to be released. The score on the Ginger Book Geek is a very well deserved 5* out of 5*.